Jason was born in Idaho Falls, Idaho, and lived with his parents Steve and Linda and brother Eric in New London and Groton, Connecticut, Orlando, Florida, Bremerton, Washington, Winthrop Harbor and Mahomet, Illinois, and Monticello, Minnesota. After graduating from Monticello High School in 1992, Jason attended St. Cloud State University to study business. He moved to Annandale, Minnesota, where he was primarily self-employed as a dealer in sports memorabilia. As a youth Jason enjoyed baseball, soccer, golfing, bowling and camping with his Boy Scout troop. He earned the rank of Eagle in 1989. Jason enjoyed sports and was an avid golfer and snowboarder in his early twenties. His favorite current sports were disc golf and kayaking. He founded the annual disc golf tournament at Sumac Hills Course at the Tim and Kathy Ray farm near Barrett. He designed and created the traveling trophy and started the course’s web site. 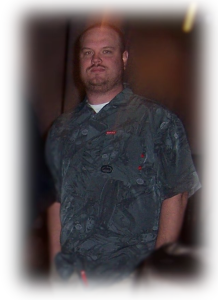 Jason was an organizer and he loved getting his friends and cousins together for activities. Jason was known for his entrepreneurial spirit. Shortly after high school, Jason and Gene Kiphuth started a video rental store in Annandale. He founded BobbleHeadDolls.com and sold sports memorabilia on e-Bay as well as at several shows including the annual Twins Fest. 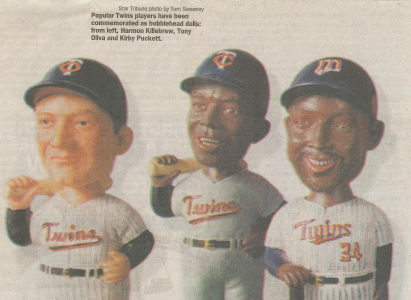 Along with his business partner Scott Keeler, he was most proud of obtaining the contracts for and manufacturing Bobble Head Dolls, including all four of the famous Minnesota Vikings Purple People Eaters; Carl Eller, Alan Page, Gary Larson, and Jim Marshall; as well as quarterback Fran Tarkenton. His creation of a Bobble Head Doll for football legend Chuck Foreman led to a close friendship with the former Viking. His company was featured in an article in the Wall Street Journal which was later reprinted in the Star Tribune in March, 2001. Jason was also known for his generosity, not only with the thoughtful gifts he found or made, but also with his time. Whenever someone needed help, Jason was there. He was very happy with his life and it is hard to find a picture of him from the time he was little where he doesn’t have a big smile on his face. Jason was famous for his thriftiness and outlandish business ventures. For example, he carried around a beat-up St. Cloud State University student ID card for nearly 12 years after he stopped attending, in the rare case of a student discount. Jason drowned while kayaking on the Snake River near Sandstone, MN, on April 17 (see more). Jason will be greatly missed by his family, friends, and his long-time love, Colleen Commerford. Below are a small number of the thousands of photos of Jason. More photos will be added as they are labeled and sorted. More pictures can be found at the Slide Show from Jason’s Funeral. (Click on any photo to scroll through gallery).